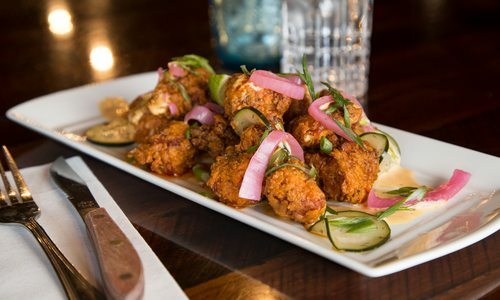 Things are heating up on the west side of Walnut Street as Missouri Spirits refreshes its seasonal menu of shareable starters, sandwiches and salads. Summer brings out my least desirable traits: being lazy and being a lush (or, for you seven deadly sins people, sloth and gluttony). I essentially spend each weekend with the same people at the same downtown haunts, too hot, tired and uninspired to go someplace new. All summer long I guzzle cold cocktails one after the other in an effort to ignore how sweaty I am. But this year was going to be different. I vowed to change my habits for the better. Deciding to tackle one unsavory quality at a time, one night I walked a little bit farther to Missouri Spirits. I know what you’re thinking: Calm down, you only walked a few extra blocks. Well, we’re dealing with an extreme case of the summer lazies. And when I walked in, I was glad it wasn’t gluttony I was trying to eliminate that night. 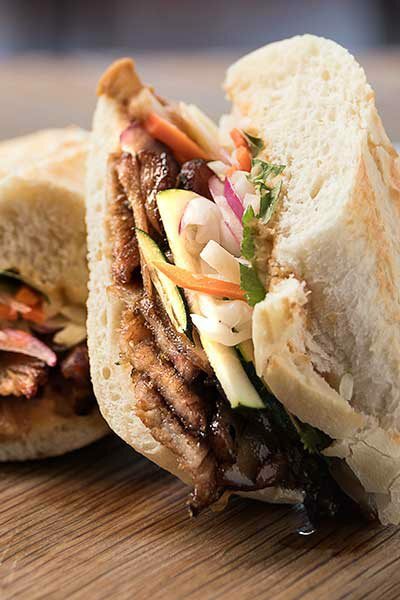 Pork belly from Gemstone Farm sits atop a white bean paste and local veggies to create the banh mi pho dip sandwich. Where things get interesting is in the pho broth for dipping. 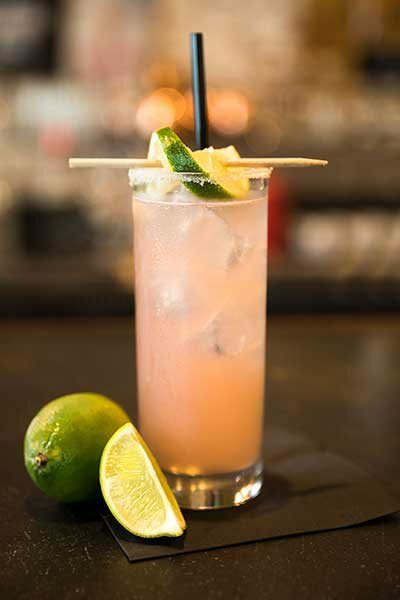 The Habanero de Jalisco drink mingles Backwoods Habanero Moonshine with grapefruit and lime, and the result is a punchy, acidic and addicting cocktail. 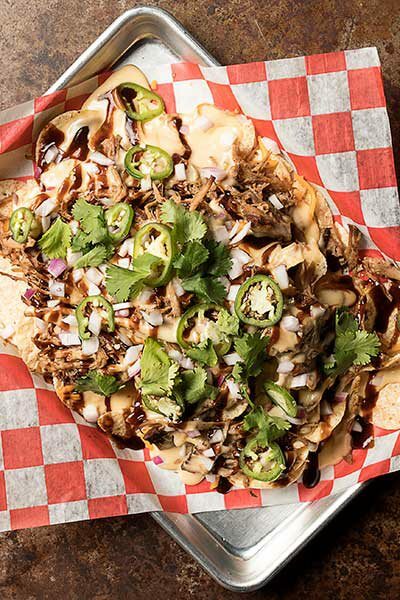 If layers of flavor are what you’re all about, the Smoked Pig Nachos should be the first thing you order. 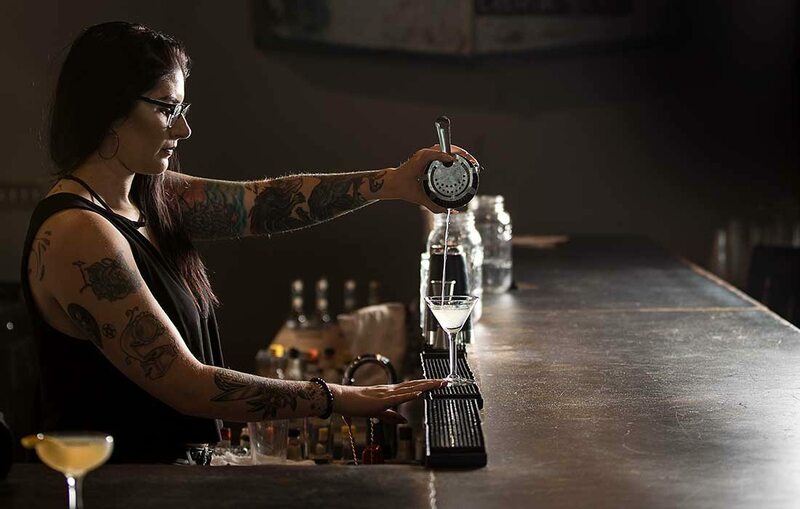 Aside from an extensive list of cocktails made with Missouri Spirits’ own liquors, the spirit house has a seasonally shifting menu of shareable starters and too-good-to-share sandwiches. Chef Cat Lix sources ingredients locally when she can, so you’ll see foods from Urban Roots Farm, Farm 2 Counter and Gemstone Farm in dishes that have global influences despite their regional ingredients. Take, for instance, the banh mi pho dip sandwich. Pork belly from Gemstone Farm sits atop a white bean paste and local veggies. Where things get interesting is in the pho broth for dipping. Although typically a soup with noodles and herbs, the pho in Lix’s dish is only the umami-packed broth made with Missouri Spirits gin and perfect for sandwich dipping. 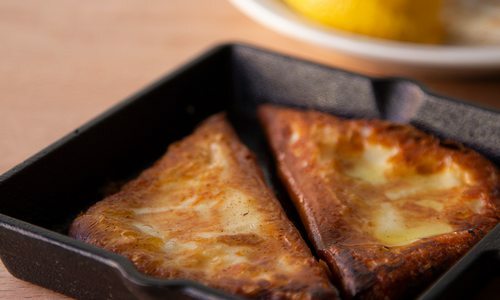 It provides a quick injection of flavor and juiciness to the thick sandwich. The saltiness of the broth plays with the acidity of the pickled veg, giving each bite multidimensional flavor. If layers of flavor are what you’re all about, the Smoked Pig Nachos should be the first thing you order. A slew of bite-sized chips is smothered in whiskey cheddar made with Missouri Spirits whiskey. Lix tries to incorporate house spirits into her dishes wherever she can, and in the nachos, the booze gives the cheddar a little smokiness that’s great on its own but even better with the succulent smoked pork. Little bites of onion, jalapeño and cilantro give the dish a little punch. Each bite allows you to play with the distribution of flavors, so you can get it as cheesy or porky as you like. Back in March when Lix first reimagined the menu, many of the dishes took on a Cajun spin. The menu is decidedly less bayou-inspired now, but the shrimp po’boy is a holdout from that first menu iteration for good reason. Fried shrimp are doused in sauce that packs the heat. The meatiness of the shrimp, the chewy hoagie and the cool crunch of the lettuce combine for a truly satisfying eating experience. It was my favorite dish of the night. Just as the food menu changes seasonally, the cocktail menu reflects the temperature shift. Because I was packing the heat with plenty of jalapeños in my meal, I went straight for the Habanero de Jalisco with a candied jalapeño rim. The drink mingles Backwoods Habanero Moonshine with grapefruit and lime, and the result is a punchy, acidic and addicting cocktail. Then, I couldn’t help but be intrigued by the Gin Gardens with heirloom tomato water. I was told the drink was “gardeny,” and that’s an apt descriptor. The jalapeño simple syrup is subtle and adds depth to the gin’s botanical notes. Lemon brightens the tomato, and hints of cucumber bring in the essence of a night wandering through garden beds—the perfect drink for the dog days of summer. 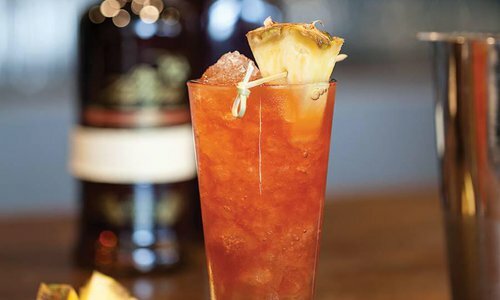 Whether you consider yourself a lush, a sloth or a perfectly well-adjusted adult, Missouri Spirits’ summer menu and fresh cocktails are worth the quick jaunt down Walnut Street for flavor-packed sips and bites. 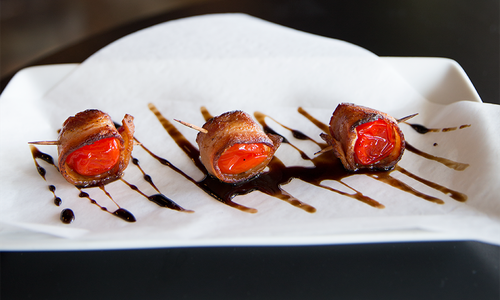 Go ahead, indulge your inner glutton.